“The disparate distribution of a nations gross domestic product amongst its population”. That is how (Sullivan & Sheffrin 2003) define income inequality. It is usually characterised by two underling issues; the inability of an economy to efficiently utilise its factors of production, and limited social mobility ranging from social classes to ethnicity and even nations. History demonstrates how inequality can act as a barrier to sustainable development; highlighted in the Brundtland Report (UN, 1987). “Quality economic growth” is the significant expression emphasised in the report in an attempt to illustrate the requirements of a more equal and democratic society. According to (World Bank 2013) the Gini index “measures the extent to which the distribution of income or consumption expenditure among individuals or households within an economy deviates from a perfectly equal distribution”. Gini coefficients measures the variances between all pairs of incomes and their and sum their absolute difference. 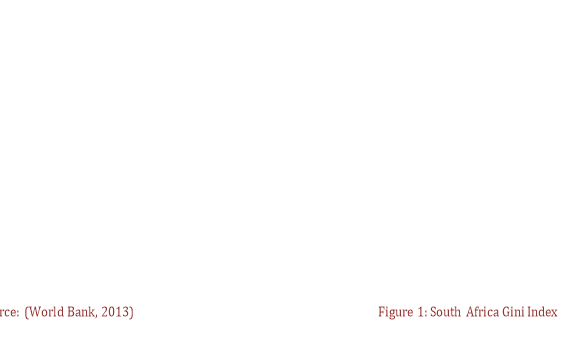 Between 1948 and into the early 1990s no official data was collected with regards to inequality levels in South Africa. Throughout this period, South Africa was still under the apartheid regime and the government were far from concerned by the clear inequality in the country. Observing the graph above it appears that inequality decreased following the dissolution of the apartheid regime and has gradually increased for most of the first decade in the most-recent millennium. Having said that, perspective is required as the data set is extremely limited, and it is possible that fluctuations may be a result of standard economic business cycles. Therefore it is impossible to use Gini data to provide empirical evidence for or against income inequality patterns. The Lorenz curve illustrated above is a graphical representation of the distribution of income among the South African population. 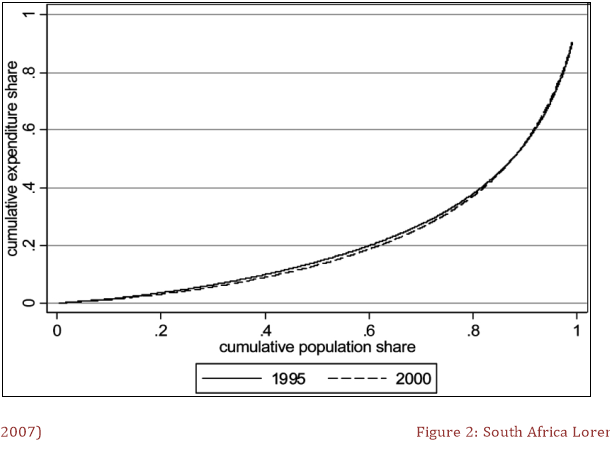 It is clear for the graph that the Lorenz Curve for South Africa in the year 2000 is underneath that of the year 1995 until it reaches the 85 per cent percentile. The Lorenz principle is void in this case as there is a intersection in the Lorenz curves. Results from the Lorenz curve should not be taken as factual as it does not take into account key dynamics that are responsible for income inequality. For example, trade union bargaining, land ownership and educational achievement (Azam & Rospabé, 2007). The Kuznets ratio can be defined as a measurement that observes the income share attained by the richest 20 per cent of the population divided by that held by the poorest 40 per cent. Data for Kuznets ratio table in South Africa is based on data available from the World Bank to date. Above is table illustrating the Kuznets ratio in South Africa, this table is based on the data available from the World Bank to date. Looking at the table it is clear that the disbandment of the apartheid lifestyle inequality seems to decrease. This is observable by comparing the 1993 and 1995 Kuznets ratios. From the data available it can be deduced that from 2000, inequality in South Africa has been increasing (7.24 in 2000, and then 9.30 in 2009). This hypothesis matches that of the Gini-coefficient data which proposes a notion of inequality rising since the turn of the twenty-first century. The 20:20 ratio is a measurement of the income share of the richest 20 per cent compared to that of the poorest 20%. Its methods in measuring inequality are similar to that of the Kuznets ratio. However the 20:20 ratio can be more revealing of the actual impact of inequality in a society. This is because the effect of outliers is reduced on the top and bottom and prevents the middle 60 per cent concealing inequality levels. Data for 20:20 ratio table in South Africa is based on data available from the World Bank to date. Results from the 20:20 ratio follow similar patterns to that of the Kuznets ratio. Inequality is seen to decrease between 1993 and 1995, however again like the Kuznets ratio it increases at the turn of the twenty first century; (20.5 in 2000 but then 25.26 in 2009). The Theil-T index is another statistic that measures inequality in societies. The Theil-T index however is unique compared to other economic inequality measurements. It is a specialised form of the entropy index, differentiating inequality between and across various groups in society. 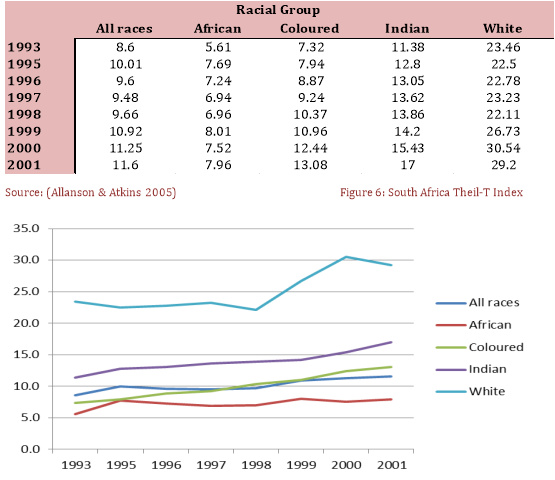 According to (Woolard, 2002) approximately 40 per cent of inequality in South Africa is between races. 33 per cent is “intra-African” and 21 per cent “intra-White. The unproductive nature of rural farming in rural South Africa has had an effect of encouraging a culture of dependency. Rural families have become heavily reliant on migrated “family member’s remittance”. Due to this culture, labour market access has played a key role in providing income for job seekers, and to those who depend on them to repatriate income. (Allanson & Atkins 2005) claim that African worker’s wages have improved by roughly 30 per cent. It is believed that the introduction of minimum wage policies (OECD 2010) has caused this change. These policies were introduced in an attempt to start rectifying the injustices of apartheid. “Apartheid institutionalised both conflict and environmental degradation … by allocating, through the ‘homelands’ system, 14 per cent of the nation’s land to 72 per cent of the population” (UN, 1987). 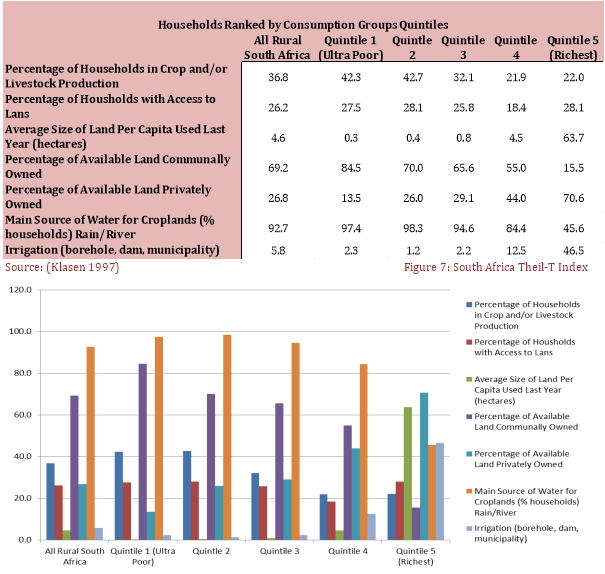 Figure 7 above illustrates how, across rural South Africa post-apartheid, the three most deprived quintiles, measured by consumption, had relatively smaller quantities of land which were shared communally, and were un-irrigated. Research undertaken by (UNDP, 2003) has hypothesised that inequitable land distribution within the country has been a stumbling block to the eradication of extreme poverty in rural South Africa. (UNDP, 2003) also highlights how “In 2002, 37.3 per cent of households’ disposable income was from property”. This indicates that the property right concentration policy enforced under the 1912 Native Lands Act, continues to extend income disparities in South Africa. At this time the African National Congress (ANC) was the new party in power. They developed a “reconstruction and development programme” (RDP) in order to combat the underlying issues in South Africa. The foundation of the programme was based around three key land-reform pillars; restitution, redistribution and tenure reform. The ANC took a market-led ‘willing seller, willing buyer’ approach. The main objective of this approach was to promote economic growth, social and food security (UNDP, 2003). According to the work of (Philip & David, 2003) roughly 1 per cent of entitled South Africans applied for restitution under the above-mentioned RDP. (UNDP, 2003) cites the fact that since redistribution was not complemented by the provision of a sufficient support scheme, success has limited. Cross-sectional studies conducted in Limpopo, (province in South Africa), established that the resources required by rural farmers to make land arable were too expensive (Eastwood, Kirsten, & Lipton, 2006). The Department of Agriculture and Land Affairs (DALA), who is responsible for implementing the land reforms, were allocated only a third of a per cent of the South African national budget in 2002 (UNDP, 2003). A DALA report on the quality of life of South African farmers, found that only 22 per cent of those farmers who profited from the land reform were able to make sufficient revenue from the land (UNDP, 2003). Academic specialists of rural South Africa believe that “suitably adapted land reform could play an important part in restructuring the rural sector in South Africa” (Deininger, 1999). This hypothesis is backed up by the fact that pilot studies led by the South African government have successfully increased rural farmer’s income. This increase has been achieved by facilitating joint schemes between White and African commercial farmers, resulting in increased access to credit, technology and consumer markets (UNDP, 2003). 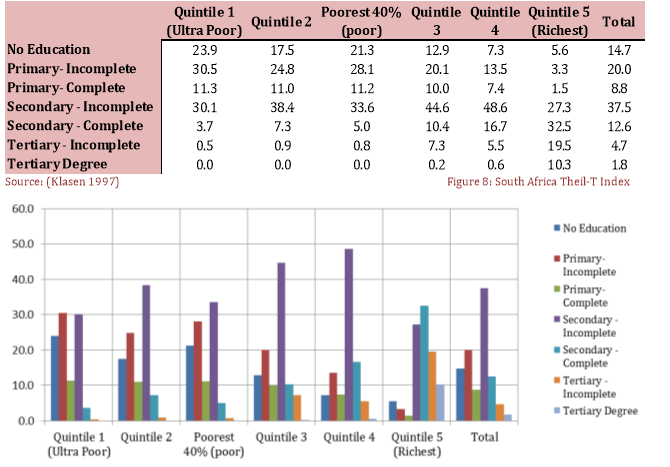 Unequal access to humdamian capital has been one of the biggest income-inequality drivers within post-apartheid South Africa. It has led to racial wage discrimination, both as a result of skills biased technological change and institutional racism (Azam & Rospabé, 2007). These factors have led to an increase and fall in the demand for white and black workers respectively (Michaud & Vencatachellum, 2003). These low returns to education for black children have negatively affected African parents’ human capital investment. As shown in Graph 7, South Africa, in comparison to most other Sub-Saharan African countries, has had relatively high levels of primary school enrolment. However, it is also worth observing that during the apartheid, the 1953 Bantu Act restricted the quality of education available to ‘non-whites’ (Michaud & Vencatachellum, 2003). “Roughly, for every 4 R spent on a White child, only 3 R were spent on an Indian child, 2 R on a Coloured child and 1 R on a Black child.” (Thomas, 1996). A panel study in Cape Town found that the amount of African students enrolled in school was positively correlated with grade repetition (Lam, Ardington, & Leibbrandt, 2011). This was as a result of the inadequate internal assessment procedures undertaken across predominantly-black public schools. Hence, grade progression within these schools was sparsely linked with cognitive ability. The study concluded that, often, for African students grade advancement is a lottery. Inadequate management within South Africa’s public school system makes human capital investment too costly for poorer African households (Edmonds, 2006). The inability of the poorest South African parents to invest in future generations’ educational attainment has exacerbated income inequality. A study into the effects of credit constraints on schooling decisions, found that, amongst the poorest black South African families, the opportunity costs of sending children to school decreased as anticipated pension eligibility increased (Edmonds, 2006). The study found that “each additional schooling year of exposure to a male pensioner increases the probability that a male completes primary school by three percentage points. (Edmonds, 2006)”. Another study (Duflo, 2004), found that increases in an elder female’s pension increased the height of younger females in the same households by 1.16 standard deviations. Cash transfers in South Africa have had successful re-distributional effects, which have extended beyond their recipients in the form of increased spending on children’s wellbeing. Within both state-run and private South African educational institutions, school fees directly limit the quality of education poorer households have access to (Seloda & Zenou, 2003). The schools with higher fees tend to offer better facilities and higher teacher-student ratios, but are often further away from the black students. A study (Seloda & Zenou, 2003) assessed the cross-cultural human capital effects of transportation subsidies, private-school vouchers and public-school spending in Central Business Districts and Black Townships. The study found that a ‘restricted-voucher’ policy, which could be offered to low-income families, would offset the fee-setting behaviour in predominantly-white areas. The study estimated that if the policy was financed by a 1% income tax rate, it could increase black student’s access to better schools by over 50 per cent (Seloda & Zenou, 2003) . In conclusion, income inequality reduction measures have been, for the most part, unsuccessful in South Africa. Market-led principles, which have driven reforms in education, labour and land markets, have not achieved the desired trickle-down effect on many of the poorest South Africans. Rather, they have directly increased the returns to factors which have traditionally been monopolised by the white minority population (Murray Leibbrandt, 2010). However, more recent signs indicate that inequality may be falling across races but increasing within them (OECD, 2010). In light of falling world commodity prices and an uncertain global economic outlook, I believe the long-term success of South Africa’s economy primarily hinges on initiatives, such as cash transfers, which will help poorer households finance their children’s access to higher-level human capital. "Income Inequality Reduction in South Africa." UKEssays.com. 11 2018. All Answers Ltd. 04 2019 <https://www.ukessays.com/essays/economics/income-inequality-reduction-south-1989.php?vref=1>. "Income Inequality Reduction in South Africa." All Answers Ltd. ukessays.com, November 2018. Web. 22 April 2019. <https://www.ukessays.com/essays/economics/income-inequality-reduction-south-1989.php?vref=1>. UKEssays. November 2018. Income Inequality Reduction in South Africa. [online]. Available from: https://www.ukessays.com/essays/economics/income-inequality-reduction-south-1989.php?vref=1 [Accessed 22 April 2019]. UKEssays. Income Inequality Reduction in South Africa [Internet]. November 2018. [Accessed 22 April 2019]; Available from: https://www.ukessays.com/essays/economics/income-inequality-reduction-south-1989.php?vref=1.